Mensusa https://www.mensusa.com/articles/tuxedo-with-tails-off-the-pique-from-the-ordinary.html Tuxedo With Tails- Off The Pique From The Ordinary A tuxedo with tails means the jacket has two knee- long extensions on the back. A tuxedo stands out of the crowd with grace, charm and elegance. Tuxedos have long been associated with important evening events, and rightly so. A tuxedo, or "tux", requires special effort and attention to carry it the right way at the right place. Tuxedos with tails are about the same, vibe wise, but rank higher on the hierarchy of formal wear. Interestingly dubbed as "tuxedo tails", "full dress tails" and "tailcoats", a tuxedo with tails is a fine example of the enduring fashion trends from the Victorian era. With few changes made to it through several tiers of fashion evolution, the tuxedo with tails is a staple to highly formal gatherings to this day. What exactly is a tuxedo with Tails? You have suits, and you have tuxedos. For those not well acquainted with the differences between suits and tuxedos- the obvious and the subtle- this may present mild to moderate confusion. A tuxedo is worn with a black bowtie, and may or may not be accessorized with a cummerbund and a waistcoat. A tuxedo has satin strips on its lapels and also along the outer seam of its trousers. A tuxedo with tails means the jacket has two knee- long extensions on the back. A tuxedo stands out of the crowd with grace, charm and elegance. A good way to visualize the difference between a tuxedo and a regular suit is to imagine yourself in a supermarket at two different times, one in which you are dressed in a suit, and in another where you are wearing a tuxedo- with tails. 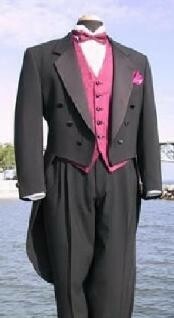 It doesn't take much to ponder and deduce that while the suit will hardly draw attention, the tuxedo will make heads turn. Subconsciously everyone knows that a tuxedo with tails means it's a prized matter to be in. A tuxedo with tails is a more snug fit that a tuxedo with a jacket. These are also more high-end than most formal gatherings and are more appropriate for "white tie" occasions rather than "black tie" meets. The only exception being white tails which are worn by many grooms. Unlike the tuxedo, when donning a tuxedo with tails, cummerbunds are avoided. Once you get into your prized tuxedo with tails, immerse yourself in the richness and vitality that will flow through you. Tuxedos with tails are serious matter and you can never look bad in them. They carry you with the right stance and vigor, drawing quiet approving glances from the magnetism you will exude all around you. You have finally received your new tuxedo with tails, nice! No other thing can cast an alluring charm like a man in a tuxedo can, and here is your opportunity to watch what magical feats follow your well-adorned feet as well! Everything will present itself in a new light, for you, dear mortal dressed as a god, will rightfully stake your claim and you take your place on your deserved throne! Adorned with suave and a confidence that seems right out of dreamy romantic tales, you will be the object of everyone's secret envy!